Bigelow Aerospace engineers see an instant moon base by using a cluster of expandable modules that are piloted to the moon's surface. Humanity's oldest flighttechnology, ballooning, proved instrumental at the beginning of the space age,helping loft the world's first communications satellite, Echo 1, 50 years ago. Now inflatable structures areseeing a resurgence in space ? they are, for instance, the foundation of a neweffort from Bigelow Aerospace to build the firstprivate space station. "We're trying to take the next step from where Echowas," said Mike Gold, Bigelow Aerospace's director of Washington, D.C.operations and business growth. "We're going to go to low Earth orbit andbeyond with expandable technology." The world's first communicationssatellite was also the world'sfirst inflatable satellite ? a silvery plastic Mylar balloon 100 feet (30meters) wide. Soaring roughly 1,000 miles abovethe Earth (1,600 km), the giant "satelloon" served as a mirrorscientists bounced radio signals off, relaying the first voice communicationvia satellite, the first coast-to-coast telephone call via satellite and thefirst image transmitted via satellite. Although satelloons that passivelyreflected signals quickly fell out of favor to make way for satellites thatactively transmitted signals, NASA pursued the idea of inflatable spacestations. "People have been talkingabout inflatable structures for a long, long time ? they're interestingconcepts," said Roger Launius, space history curator at the Smithsonian's National Air andSpace Museum. "People were talking about them in the '50s, and a lot of studieswere done in the '60s." The challenge with puttingstations in space is that they are potentially both large and heavy. Inflatablestructures help address both problems with relatively lightweight componentsthat can reduce their size inside the limited space aboard rockets and thenexpand once in orbit. "The fundamental advantages of inflatable structures ?or, as we prefer, expandable systems ? still remain true," Gold said. "You can get a large amount of volume into a slim rocket fairing, and saveon mass and cost." NASA even commissioned tire-makerGoodyear to construct prototypes for an inflatable space station, whichresembled nothing less than a big rubber inner tube. Still, "the main concern was that micrometeoriteswould hit and deflate them," Launius said. "They were abandoned inthe late 1960s." The resurgence that inflatablestructures saw beginning in the 1990s owes thanks to advances in syntheticfabrics. "Kevlar and other composites are much more rugged, hardy materials,can withstand much more than a Mylar balloon," Launius said. Currently, Bigelow Aerospace has twofully inflated spacestation module prototypes already in orbit. In2014, the company plans to launch real modules to assemble them into the firstprivate space station. Two years after that, a second station is scheduled tofollow. Space entrepreneur RobertBigelow, founder of Bigelow Aerospace, has ambitionsbeyond inflatable stations in orbit ? he envisions inflatable moon bases as well. NASA has already tested an inflatablemoon base prototype at the South Pole, and this year launched a contest forstudents to design the best inflatablehouse for life in space or on another world. NASA scientists even have saidthat inflatable modules could be part of future missions to asteroids and toMars. "We've pretty much overcome complaints when it comes toinflatable structures about potential hazards in terms of both deflation frommicrometeorites and orbital debris, and of inflation ? of them inflating toofast and exploding," Launius said. 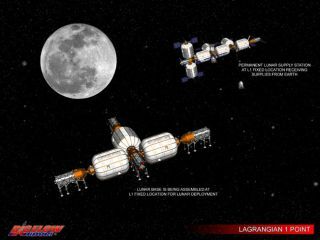 "Any depictions ofdevelopment of space beyond low-Earth orbit, at a Lagrange point or the moon orMars always involved expandable space habitats," Gold said. ?Lagrangepoints are positions in space where the gravitation tug of objects balance out,allowing spacecraft to take up station-keeping positions. There are fiveLagrange points around Earth. "Expandable structures arethe next logical step in the evolution of habitats. There were a lot ofquestions about the technology, and a lot of detractors, and a lot of themdidn't think our structures could survive the launch environment, much less inspace. Our work so far has lived up to the promise we all hoped for them."